Have you ever tried organic skin care? You should. More specifically, you should go out and buy Acure Organics right now. You won’t regret it at all. Acure’s mission is to be a sustainable company. They use green packaging, recycled materials and every lotion that they sell plants trees. They are doing some amazing things! In the past, when I heard the words organic and skin care together, I cringed. It probably didn’t smell good and probably didn’t do much for the skin. 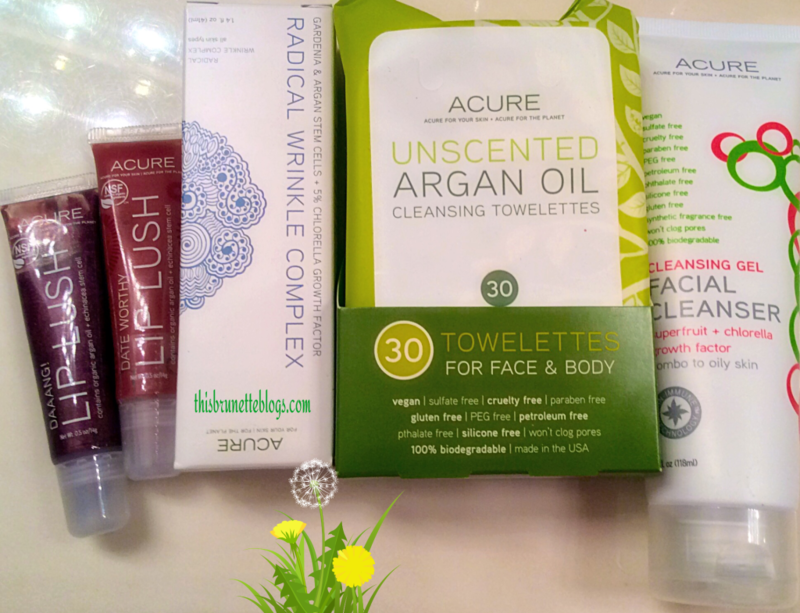 My mind is currently blown by the products that Acure Organics sent to me. They sent over some pretty awesome items to help me take care of my aging skin. The packaging for Acure Organic products is fitting. They are not over sized or wasteful and is 100% biodegradable. Acure is not flashy or too busy. Argan Cleansing Towels ($8.99) – I love a good cleansing towel and these are winners in my book. I use them to take my make up off, before washing my face. They are on the thin side but nothing I couldn’t work with. They had a very faint scent that is not overpowering at all. Facial Cleansing Gel with super fruit and chlorella growth factor ($14.99) – Don’t let the long name fool you. This face gel is simple to the core. It works double time to remove dirt, oil, and makeup and helps maintain your skins acid mantle. It contains FAIR TRADE ingredients, which makes me happy. It smells like a lemon furniture polish at first but once you lather it on the skin it is less lemon-y. Radical Wrinkle Complex ($29.99) – I put this on after cleansing with the above products. The consistency was like a thin lotion and the smell was kind of weird at first. It is not perfume-y but not bad by any means. I guess it could be described as natural smelling. This lotion soaked into my skin well and it made my skin feel amazing. It is packed with amino acids and vitamins to fight wrinkles and promote new cell growth. I believe this would be a great product for someone with sensitive skin too. Lip Lush in Daang and Date worthy (7.99) – The rep from Acure was kind enough to send over a color (Daang) for me and one for my daughter (date worthy). Such personal attention makes me so very happy. I tried both of them and I am in LOVE. The most important thing is that they don’t have an aftertaste AND they don’t smell like perfume. The only way I can describe the taste was a fresh fruit, not artificial at all. They contain some great plumping and protecting ingredients like argan oil, Echinacea and edelweiss stem cells. The colors were right on and perfect for both of us. Acure products are at a price point that everyone can experience natural, organic products. I would recommend this brand for any sensitive skinned gal or a gal that just wants to be natural in her daily life. I am now anxious to try their other products like shampoo and conditioner. Thank you Acure Organics for allowing me to try your amazing products. **I was not paid for this review and these opinions are 100% mine.